Meaty foods, like brine shrimp, white worms, daphnia, etc. 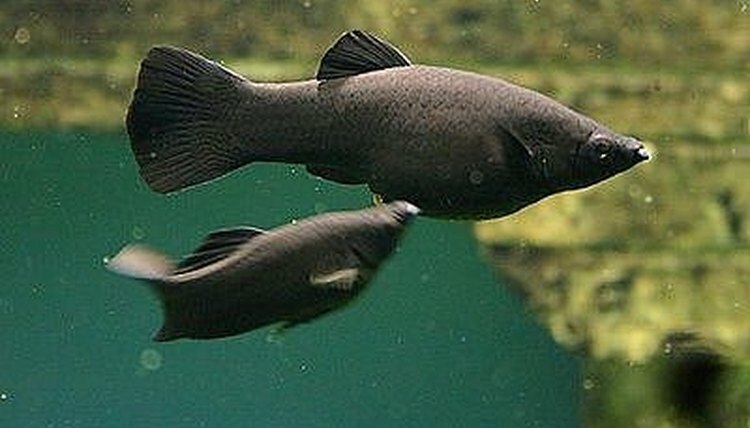 The common Black Molly is a livebearing fish that is fairly easy to breed. I had a 20 gal. tank set up for my breeding mollies and started with about 4 of them. After a couple years, I was giving them away and selling to local aquarium shops, I had so many. There was a constant supply of breeding mollies and young, growing fish in one tank (photo below). They are a fun fish to watch and will happily breed if you give them the right conditions. Let's find out how. SET UP TANK -- When breeding mollies, water conditions is important. Mollies live in estuaries in Central America, which are are a mix of ocean and freshwater (brackish), so try to set up your tank like a Estuary/Mangrove Biotope. My tank had about 1/2 teaspoon salt per gallon (you want about 1.005 to 1.008 salinity) and temperature around 78F-82F. Plants are not important, but Java Fern will grow in this water. Put several pieces of driftwood on the bottom where the baby fish will hide and eat. Let the water stabilize for a couple weeks to start the good bacteria colonies. 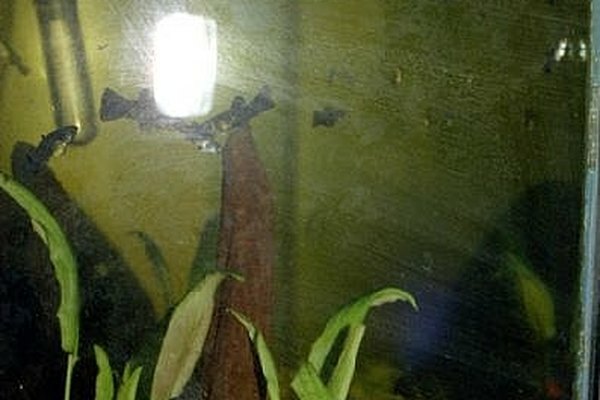 You also want plenty of algae growing for molly food, so leave a light on. STOCK YOUR TANK -- Once the tank is stable and aged, introduce about 4 to 6 mollies of your choice. 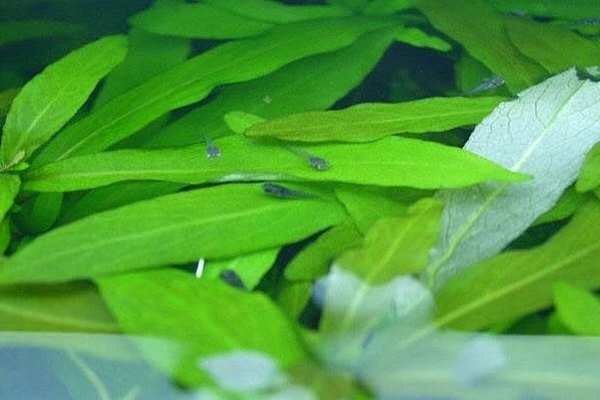 Stick with common black or marble mollies to start -- these are the easiest to breed. Make sure you get a mix of males and females - two males and four females is a good balance. Do not put any other fish species in the tank if your intent is breeding. If you want a community tank, the you can add guppies, swordtails and maybe gobies to the tank, but the baby mollies may not survive as well. CONDITION THE FISH -- Mollies generally are vegetarian and eat algae and other plant matter, and flake foods. But to get them in breeding condition, I added newly hatched brine shrimp and white worms to their diet. Keep the breeding mollies fat without overfeeding and fouling the water. Change about 10-20% of the water weekly, remembering to add about 1/2 tsp of salt per gallon to the water you're adding. I just used our tap water, which was very hard water (from a private drilled well). 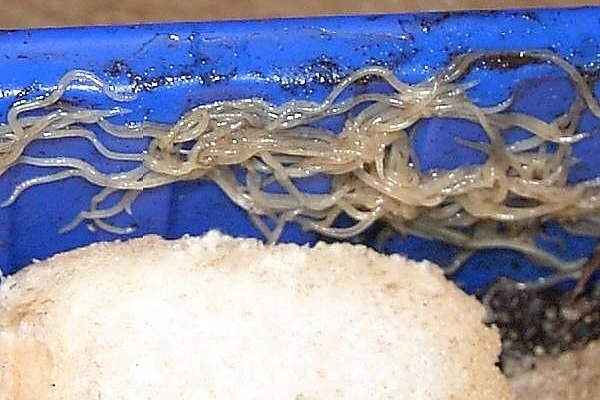 WATCH THEM GROW -- If you have given them good water conditions, and they're eating well and are healthy, then the breeding mollies will do their thing and you'll have baby fish down hiding in the driftwood within a month or so. The babies will eat newly hatched brine shrimp, or just scraps of flake food or algae on the bottom. I did not do anything special to feed or protect them. Of course some were likely eaten or died, but the population of the tank kept increasing anyway.